This upscale resort features a 1960s Hawaiian Modern aesthetic in a lush garden setting. Guests will be transported back in time through authentic mid-century furnishings and décor. Spacious king rooms offer private Lanais and modern amenities. With its lush surroundings and teak accents, the magnificent pool is the centerpiece of this beautiful hotel. Centrally located in the heart of Waikiki, the hotel places you just a short walk to the ocean, restaurants, shops, and nightlife. For active guests, a myriad of outdoor activities and water sports are available nearby from kayaking and boating to surfing and jet-skiing. 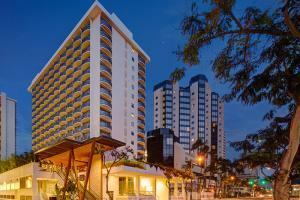 Centrally located in the heart of Waikiki, the hotel is just a short walk to the ocean, restaurants, shops, and nightlife.